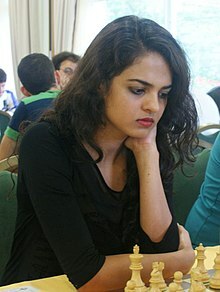 ↑ "Tania Sachdev joins the Chessdom commentators team". Chessdom. 2013-11-06. Retrieved 2013-11-20. ↑ "Young champions are back". The Hindu. 2000-04-04. Retrieved 28 January 2016. ↑ World Championship in U18 categories. 25/10-7/11/1998. chess.gr. Retrieved 28 January 2016. ↑ Ramirez, Alejandro (2016-03-20). "Indian success in Iceland" (in ଇଂରାଜୀ). ChessBase. Retrieved 2016-08-31. ↑ Shah, Sagar (2014-07-04). "Improve Your Chess With Tania Sachdev". Chessbase Chess News. Retrieved 5 September 2016. ↑ Pähtz, Elisabeth (2014-12-14). "Tania Sachdev got married". ChessBase. Retrieved 7 November 2015. ↑ "Don't mind being called a chess hottie: Tania Sachdev". mid-day.com. 2014-06-08. Retrieved 7 November 2015.